Given its unique physical appearance, Pyestock offered a perfect futuristic, industrial, sci-fi backdrop for a number of films and programmes. 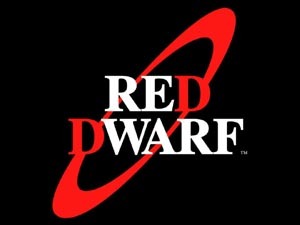 Location managers started targeting the site even before its closure (with Red Dwarf being shot in the mothballed Cell 4), whilst those in the 2000s had the run of the entire site. This sometimes lead to physical alterations in the cases of Cell 3 and Cell 4 for the Hollywood film Sahara. Dr. Roxbee Cox, one of the first directors of Pyestock, talks somewhat slowly and stiffly, but authoritatively, about progress in gas turbine research over the past several years. 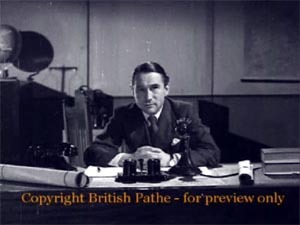 These unedited rushes also give a glimpse into the filming process employed by Pathe at the time. Cox is a true professional, delivering his speeches in single takes, and is only interrupted in one performance by some idiot clomping across the soundstage.
" The inferno of the bench-test rooms at the National Gas Turbine Establishment at Pyestock ." The Pathe team captured the early gung-ho spirit of the initial Pyestock pioneers as they doned ear protectors and cowered behind glass screens whilst before them early gas turbines would shudder in their test rigs, beltching fire and dripping liquid fuel. 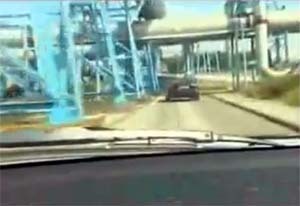 This was probably the only footage shot of the old Pyestock site before the new site was constructed.
" Costing six and a half million pounds, it's the best of its kind in western Europe ." 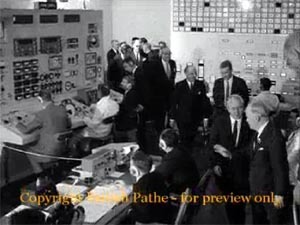 Prime minister Harold Wilson was on hand to inspect the grand opening of Cell 4, thus making another step towards getting the Anglo-French Concorde into the air. This fantastic film shows the brand-spanking-new control room and main testing area of Cell 4, along with a descriptive voice over giving the consise facts about Cell 4's function.
" Now for the engines "
A poor man's James Bond it may be, but Some Girls Do gets off to a roaring start when Joanna Lumley single-handedly destroys Pyestock before the opening credits have barely finished. 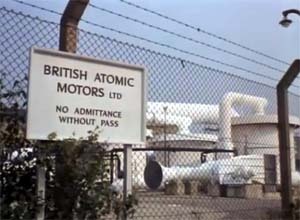 The action starts at 4:20 when Joanna is picked for the mission and the location switches to the mysterious "British Atomic Motors Limited" (or rather the CECA Facility viewed from the perimeter fence). I haven't been able to pinpoint the location of the interior control room shots (I think it might be the GLEN Test Cell ), but CECA is featured as an exterior again, before the other female agent makes her getaway along Weir Road . 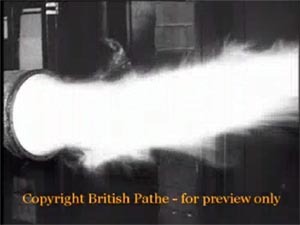 Despite the whole of Pyestock exploding in an unconvincing special effect, the facility makes another appearance (at 12:50) when the hapless Mr. Mortimer is entertainingly bumped off.
" Near Shadwell Lane "
The scale of Pyestock is apparent in this scene when Taviner and Hollis rip it up around the just-closed facility and embark on a white-knuckle tour of its major points-of-interest. It all ends in disaster with a massive explosion at the end of the Air House. Is it curtains for Taviner, Hollis and the Air House? Cell 4, or rather the small hatch into the cell itself, was briefly used as a set for the Red Dwarf episode Epideme . It�s notable for two reasons: firstly as the first time Pyestock was used as a film set and not as itself in a film; and secondly, for the limited, cramped filming style, which does nothing to really show the interior of Cell 4. It's reduced to a series of gangways and ladders. The location manager probably made his money that day by suggesting the entire crew decamp to Pyestock because he�d found a "seriously good door." 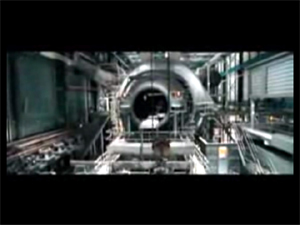 Lister opens the door to the testing chamber at about two minutes in. And his line certainly rings true: " This place is harder to get into than an airline Chicken Kiev. " Further parts of Cell 4 then follow, but they're all beneath the cell itself, and only consist of walkways. Door fans will be pleased though, as the door reappears seventeen minutes in. Lewis Collins Ross Kemp in The Professionals Ultimate Force is kept busy by pesky terrorists who are camped down in Beckton Gas Works Pyestock. Anyway, the SAS are sent to Chechnya to find rebel leader Movzar Mazayev. They find his cronies holed up in a "disused gas works" and so the plot naturally proceeds to a climatic fire-fight at this location. Of course, it�s all Pyestock, and the first glimpses of the familiar blue pipes can be seen at 23 minutes into the programme, where Cell 3 has doubled up as an impromptu firing range. Other parts of Pyestock can be seen at 30 and 32 minutes, but the final battle really shows off the site with Cell 3, Number 10 Exhauser and Cell 3 West all appearing before everything is destroyed by an air-strike. Interestingly most of Chechnya looks like the wooded scrub area around Fleet Pond. 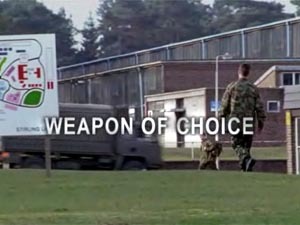 Eagle-eyed Pyestock experts will instantly recognise the Fire Station/Stores in the opening credits which doubles up as the SAS�s UK base. This suggests that this part of Pyestock might be used in other parts of the series. Whoever owned Pyestock in 2005 did some sterling business with the film business. Whilst Ultimate Force brought in a fistful of readies, Hollywood financed Sahara would've seen the cash turn up in briefcases. And unlike previous productions, it seems that director Eisner and his team were given carte blanche to modify any of the cells as they saw fit. Pyestock was now a solar detoxification plant owned by Massarde Industries. Cell 4 doubled up as a giant, sun-powered incinerator whilst Cell 3 became a loading and transporting bay for drums of oozing nastiness. The production team removed some of the piping from Cell 4 (thus allowing Penelope Cruz to clamber into one of the pipes for the all-important reveal of the cell) and added flimsy "doors" to the mouth of Cell 3. "Massarde Industires" stickers were liberally stuck over everything, along with radiation symbols; a move which confused the hell out of early explorers. The film is an entertaining romp although Pyestock itself doesn�t appear until the last quarter of the film. But it stands in well as the baddies' evil lair. 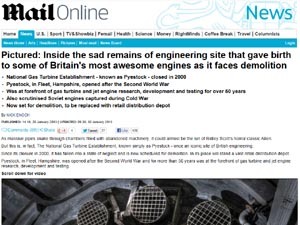 Pyestock was the star of this lengthy pictorial by the online Daily Mail which used the site to illustrate the decline in British engineering and history. The pictures of Matt Emmett were used to illustrate the piece and provided a haunting view of some of the site as it appeared in 2011-2012. Other DVDs of note are historical documentaries of early air technology. These include Farnborough Above And Beyond, Frontiers Of Flight and Creating Concorde (The FAST Collection). I've yet to get these an review them, but have been told that they all feature Pyestock. For example, the stills below were taken from Creating Concorde. (Many thanks to Ashley for the info).